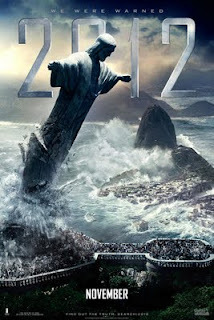 The movie 2012 - about the end of the world as predicted by the Mayan calendar centuries ago - is a classic disaster movie in the vein of Armageddon, Independence Day, The Day After Tomorrow, Earthquake, or The Towering Inferno. And while it might seem odd for a church worker like these, I love watching these disaster flicks. But it's not just for the special effects and epic scale of these movies; it's seeing how humanity reacts whenever they know their imminent doom is approaching. 2012 follows the journey of Jackson Curtis (John Cusack), an incredibly lucky guy in the face of the apocalypse - it's truly amazing how he can outrun earthquakes and volcanos while everyone else just perishes. To put it simply, the planets are in alignment, which means that the sun is erupting in violent ways (why? i don't know...) and thus, the earth is cooking like a microwave - it's plates are shifting and moving at incredibly fast rates, causing turmoil for us earthlings. But no matter how it happens, from plate tectonics to an alien invasion, asteroid, or global warming, these "the world is ending" disaster movies challenges audiences with the same question over and over again: why will it take Armageddon for us to finally learn how to be loving, compassionate, and merciful towards each other? Why can't we learn that lesson now - before the aliens, the asteroid, or the erupting sun hurls towards us? Sadly, the disciples and the early Church didn't get it - and they continued to live in fear that the end was coming tomorrow. When the fear wore off after several centuries, quite sadly, the people (including the Christians) forgot their humanity and we entered the dark ages. There's a popular saying that goes something like: "Look busy... Jesus is coming!" That seems to be society's mentality - let's wait until the last possible second to start living the gospel; in the meantime, just look busy. Perhaps as long as society keeps forgetting to be more peaceful, loving, compassionate, and forgiving with one another (on a personal and a global scale), we will keep having disaster movies to keep reminding us of the message: Be prepared, live the gospel, love one another - for you do not know on which day the end will come. PS: This message hit home for me this week. One of my co-workers suddenly and unexpectedly passed away yesterday. In my reflection on this tragic event, I wondered what my last words were to her or how I treated her in this last week of her life. Was I prepared and did I treat her with gospel compassion and love - or did I forget this timeless message? Whether the last days are coming in the year 2012 or if they come tomorrow, let us all pray that we will live each day as if it were our last. my first time to chance upon your blog. i think i'll be checking this out more often. intelligent reflection. please do keep this up.